Gioachino Antonio Rossini (1792 – 1868) was an Italian composer who wrote 39 operas as well as some sacred music, songs, chamber music, and piano pieces. He was a precocious composer of operas, and he made his debut at age 18. 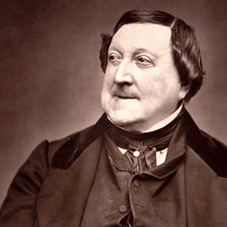 Rossini moved to Paris in 1824 where he began to set French librettos to music. His last opera was the epic William Tell (Guillaume Tell), featuring its iconic overture which helped to usher in grand opera in France. A tendency for inspired, song-like melodies is evident throughout his scores, which earned him the nickname "the Italian Mozart." He was a rapid and prolific composer, quoted as joking, "Give me the laundress' bill and I will even set that to music." He also earned the nickname "Signor Crescendo" for his use of an exciting buildup of orchestral sound over a repeated phrase, which is now commonly known as a "Rossini crescendo". Until his retirement in 1829, Rossini had been the most popular opera composer in history.